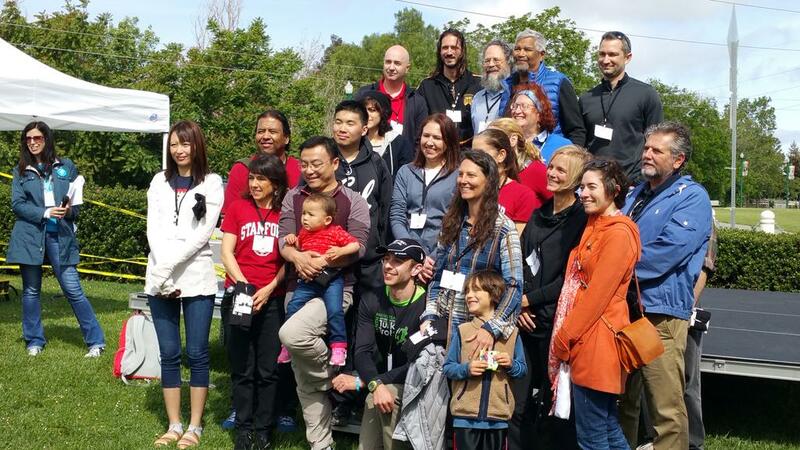 Today, approximately 475 of the Parkinson’s community participated in Moving Day® Silicon Valley, a National Parkinson Foundation walk event. Like other significant occasions, it was nothing like we imagined and more than we could have dreamed. As the chairperson of this debut, I feel privileged to have had a bird’s eye view of the event. Who would imagine that in the middle of the California drought, it poured all night on the night before the event! The grass was soaked when we arrived, and the big gray clouds and cold wind gave us a somber greeting in the early hours of the morning. As we set up, who could imagine that our single power source would break, leaving no power for the microphones, our Zumba dance, or anything that required big sound. Through the ingenuity of Colleen Fischer, our Moving Day® Bay Area coordinator, Plan B was whipped into action, and sound—though not robust sound—was made possible on the stage. In spite of the power setback, exercise ambassadors donned their bright yellow tshirts; instructors arrived at the Movement Pavilion; teams formed, the community flowed in and the weather brightened. The Parkinson’s Pioneers, our leaders in neuroscience research and Parkinson’s disease appeared in full force. Dr. Helen Bronte-Stewart, Director of the Stanford Comprehensive Movement Disorders Center and the Stanford Human Motor Control and Balance Laborarory spoke on behalf of the Pioneers. Kama Sanguinetti, Senior Director, Chapter & Community Relations at National Parkinson Foundation announced their names and titles to the audience, while we handed each honoree a Parkinson’s Pioneer t-shirt made possible by Circuit Therapeutics. As an added gift of kindness, Elaine Sulzberger, a Parkinson’s Women Support member, Moving Day committee member, and expert baker baked delicious cookies for the Pioneers’ goody bags. 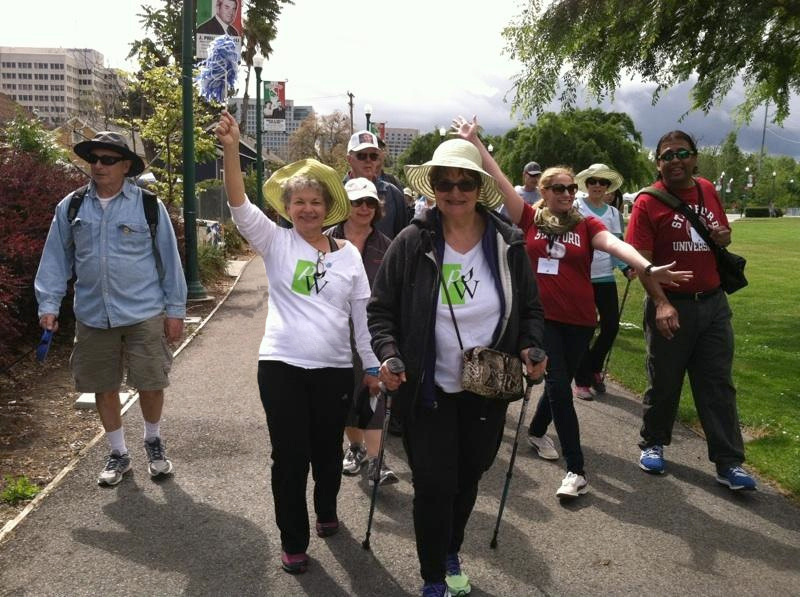 After a countdown, the walkers began their walk, and an amazing number of people chose to walk 1, 2, 3 and more miles. Meanwhile, Zumba, tai chi, QiGong, boxing, pole-walking, PWR! exercises, hula, pilates, throat and balance exercises and more were going on. The resource pavilion was bursting at the seams with clinical study signups headed up by Dr. Kathleen Poston, Assistant Professor of Neurology and Neurological Sciences and (by courtesy) Neurosurgery at Stanford University Medical Center. Moving Day committee members Steven Russell, Charmaine Eng and Robin Gaffney did a beautiful job of displaying printed literature, even in the damp surrounds. Amazing connections transpired as people shared their experiences with each other. For instance, hula instructors Nadia Le’i and Jennifer Wright joined several Pioneers for a Zumba class on their time away from teaching. Doctors from UCSF, Stanford, Kaiser and the Gladstone Institute chatted with each other. My sister Merry Graham was talking to someone she hadn’t met before about our mom’s progression with Parkinson’s. I was very moved when Daniel Zwilling approached me with an enormous crowd from Circuit Therapeutics to express their gratitude for being the inspiration in creating the Parkinson’s Pioneers ceremony. The Papa Caron team appeared as a force dressed in custom blue tshirts (including the dogs), and Team Garvey family received a constant stream of visitors from their overflowing tailgate tent, as did Martha Gardner’s successful team the PAYOs. Charlie traveled all the way from Jackson to walk with her family of 13 who dressed as angels. 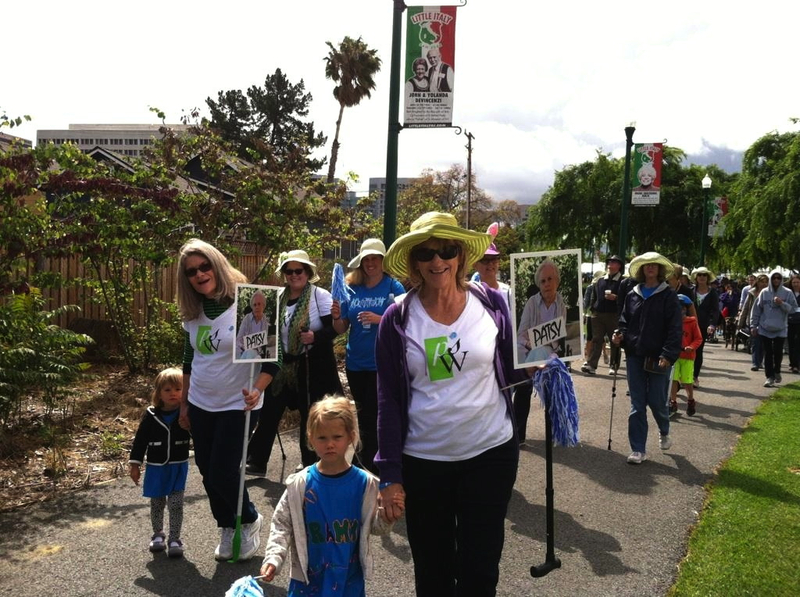 Charlie’s Angels were one of 34 teams who registered for the walk. People with walking sticks and canes walked with their families. Ann Boyton from the East Bay—in charge of a wonderful kid’s corner with art projects—found time to bring me sandwiches for my son at the close of the event. At the end of the event, I watched my three young grandnieces romp on the grass in the tshirts they had painted by themselves in memory of my mother who just passed away this week after having Parkinson’s disease for thirty years. It reminded me of the family connection I had felt throughout the day with everyone. 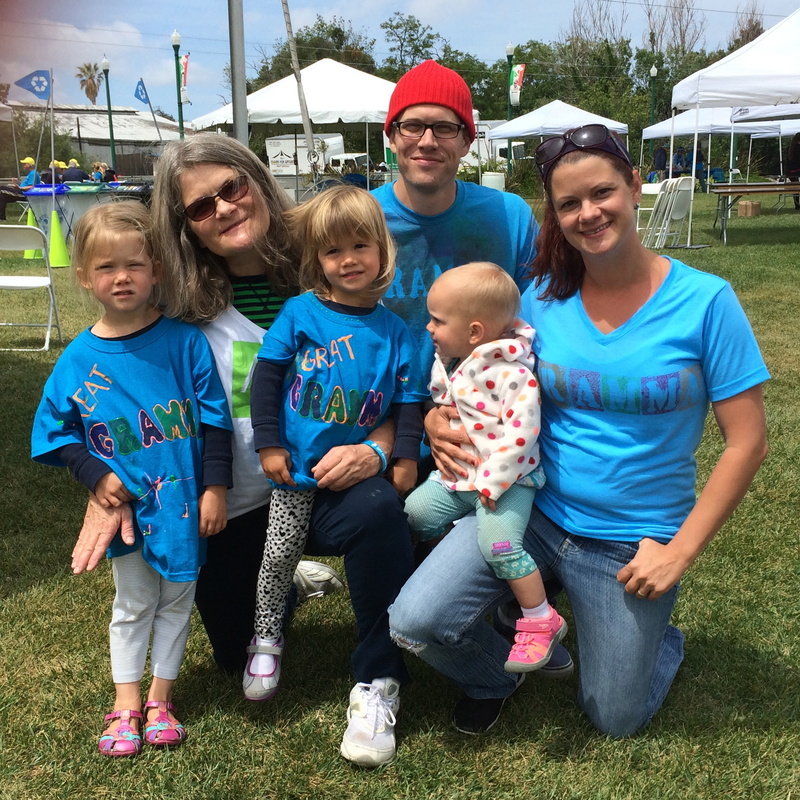 For the Parkinson’s community it was a day of sharing, caring, and supporting each other. Mom would have been proud. Thank you to the National Parkinson Foundation. Awww Darcy what a moving, splendid, and accurate account of our wonderful MOVING DAY! Thanks for letting me take part!